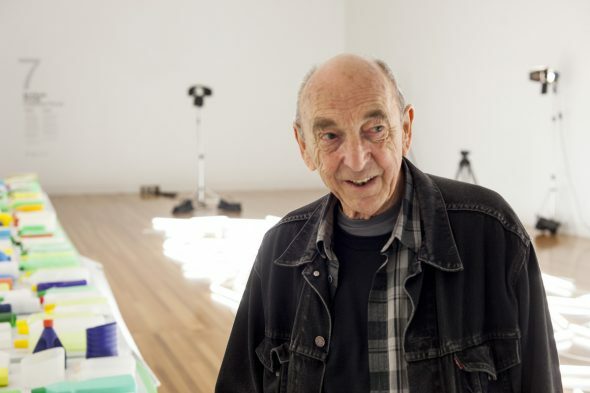 New Zealand expatriate artist Bill Culbert passed away on 28 March 2019. Here, Curator of Photography Athol McCredie, and Curator of Modern & Contemporary Māori & Indigenous Art, Megan Tamati-Quennell, reflect on some aspects of Culbert’s work. I first saw Bill Culbert’s work at the Dowse Art Gallery in 1978. 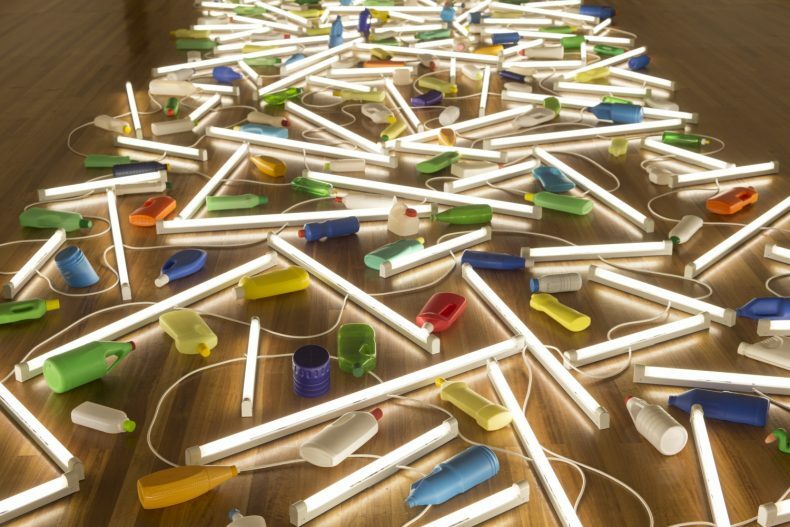 It was a solo touring exhibition and was mostly sculpture – fluorescent tubes stuck through suitcases or sheets of corrugated iron and boxes that presented confounding optical illusions with light bulbs. There were also photographs, though not photographs as I knew them. They were quite different from the personally expressive variety that were now beginning to make inroads into public gallery exhibitions and collections. They seemed to me like deadpan, conceptual photographs in which the person behind the camera was refusing to make their presence felt. However, I also recognised that they tended to be about the very things that photographers notice – what I would summarise as camera vision. That is, the way things appear to the detached eye of the camera but glossed over by most of us in daily life. These include how the world changes according to where we stand, the substance of shadows, the nature of light. If Culbert’s images seemed to have an emotional absence this didn’t mean there weren’t consistent concerns or a particular sensibility that ran through them all. Part of this sensibility was a bemused sort of humour. I think of some of his images as Zen jokes. Like the light bulb that shines pathetically in the sun. Here, a light that provides a substitute for sunlight at night is rendered impotent by the very thing it simulates, undermining everyday reason. Or the glowing light bulb that throws its own shadow. The physics of these is easily explained but our lazy habits of perception still provoke a ‘What the…?? ?’ response. I finally met Bill several decades after that Dowse show and found him a friendly, affable and low-key man with no pretensions and a ready chuckle – the latter characteristics exactly reflected in his work. His passing marks a loss to the world of a genuinely nice person. Rest in peace Bill. I first met Bill Culbert through Ian Wedde with the development of VOID, that Bill and Ralph Hotere created together. VOID, 2006, was a collaborative project between the two artists, a site specific sculptural installation commissioned to occupy a space also known as the Void within Te Papa, a central space that conceptually spans the building from the level two Wellington Foyer through to the level six ceiling. The installation was made up of simple forms; a cool white neon circle that encases a matt black rubber circle on the floor and a diagonal neon that bisects a dense black circle painted on the ceiling. It is the epitome of elegance and simplicity and speaks strongly to both Bill and Ralph’s practice. VOID was the last collaborative work the pair created together. Bill and Ralph’s collaborative works made in the latter part of both of their careers, are significant works, reflective of their extraordinary friendship and artistic synergy. The pair met in London in the 1960s, were aware of each others work and became friends after Ralph was taken to Bill’s for dinner by a mutual friend. Their collaborations, like much of Bill’s work are masterful. The signature traits of their collaborations are sophistication, the reduction of their work to essential concepts and its forms, and what I can only describe as effortless cool. The only comparison I can make with the fluid elegance of their combined work is jazz: the innovation, talent and ease from jazz greats like Thelonius Monk or Miles Davis. A favourite collaborative work for me and related to both their connections to Dunedin and Port Chalmers, and I suppose my connection to Otakou across the water from Port Chalmers, is Pathway to the sea / Aramoana, 1991. 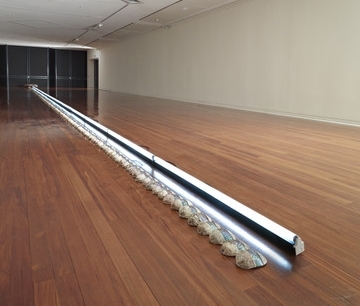 It is a floor-based work made up of a row of paua shells, with a strip of iridescent colour ground out and shown on each shell, a parallel length of neon, and a large stone at either end to ground the work. The power of Pathway to the sea / Aramoana, is in its simplicity, its understated and pared back nature that stretches out across a gallery floor. A subtle but commanding work, it is at once reflective of the sea and evocative of both the Māori concept of aramoana and of the actual place – a small coastal settlement south of Dunedin, with its landmark breakwater that extends 1200 metres from the land out into the sea. The working drawings that sit with the work speak to Bill and Ralph’s amazing friendship, their combined love of food and good wine, as well as their working process. What has always struck me about their combined works was the balance and integration of each of their practices. Their works seem like true collaboration to me, with neither overshadowing the other in a meeting of artistic sensibilities and minds. It is always clear which elements are Bill’s and which parts are Ralph’s, but together, one adds and enhances the other. There is a rare combination of mutual respect and eloquent artistry. And a match of difference, one working with illumination, the other with inky darkness: black upon black, upon black. Bill told me he had made reference to Ralph, who had died in February 2013, in one of his works created for Front Door Out Back, his Venice Biennale project representing New Zealand in the 55th Venice Biennale of 2013. In Daylight flotsam Venice, 2013, amongst all the plastic bottles of the installation that are strewn across the floor like they are floating in water, Bill placed a bottle for Ralph. 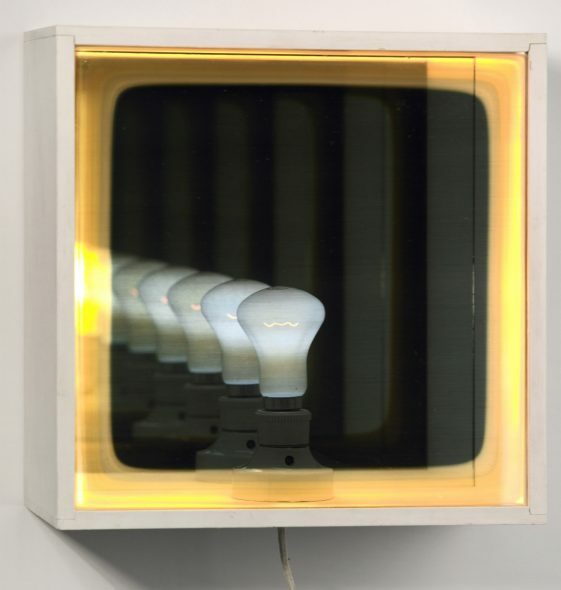 I will miss Bill Culbert, he was a wonderful man and artist. He was warm, kind, down to earth and with a humility that belied his talent and ability as an artist. I feel privileged to have met and to have known Bill and to have shared a titi (mutton bird) or two with him. Moe mai ra i te rangatira. Aroha and sincere condolences to Collette and Ray, the late Clay and the late Pip, and all of Bill and Pip’s family and many friends. 1. Bill Culbert in ‘Into the Void, Sarah Farrar interviews Bill Culbert’, Off the Wall, issue #7, December 2014, Te Papa. Thank you Athol and Megan for your words about Bill. I couldn’t agree more with you. Bill had the ability to create extraordinary works which would attract the attention of people from all walks of life. People would be amused or in awe when they first set eyes on the works which were placed on the floor, walls, or in the air. Slowly their mood would change as they realized the deeper meaning hidden beneath the bottles, lights, chairs, shells etc. Then expressions of enjoyment or sorrow would develop in response to the works, and interesting conversations developed. Bill’s art could be many things but it worked like magic as it was so very thought provoking! He was a very clever artist and will certainly be missed. Rest in peace Bill. Carol Henderson . Last time I saw Bill,we were viewing his exhibition in Auckland. I said to my husband I will have to write to him and send photos of the light reflected on the windows with the pohutakawa from Albert Park behind. Who should come into the Gallery but Bill with Chris Saines. What a joy it was to see him and remember happy times spent with Ralph.